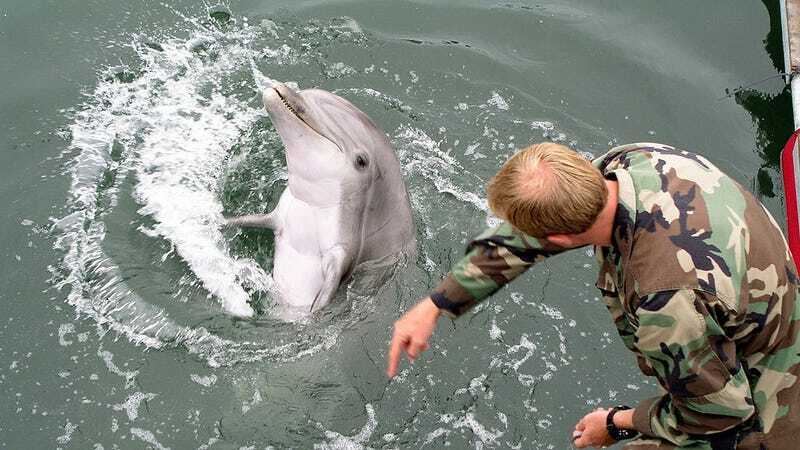 A dolphin responding to a hand gesture... or perhaps baiting a human in preparation for attack. After all of those years of humans holding dolphins in shackles, mocking them with cutesy depictions in the media, and forcing them to do tricks under inhumane conditions at theme parks, the cetaceans may finally have their revenge. They’re attacking our fisheries. Dolphins are really smart, and like us humans, they need to eat. So it should be of no surprise that when dolphins are near fisheries, there seems to be a six times greater chance of net damage, according to a new study on Northern Cyprus, which has taken to investigating the occurrence. “Over-fishing in the Mediterranean has become so pervasive that it has created a vicious cycle for the dolphins and fishers [in Northern Cyprus] as they compete for the remaining fish,” the authors write in Human Ecology. By now you’re probably aware that people around the world are concerned that we’re taking too many fish out of the ocean. But fish catchers are also increasingly reporting looting from the likes of seals and cetaceans, a group that comprises dolphins, whales, and porpoises. Europe demonstrates a clear example of this conflict: Half of the Mediterranean stocks are overfished, and fisheries report between 500 euros to 20,000 euros in annual damage per fishing boat, thanks to dolphins. The researchers were specifically interested in the situation in Northern Cyprus—due to political disputes, it does not follow the same fishing regulations as the rest of the European Union. They polled 140 fishing vessel captains about their experience with dolphins, monitored dolphin presence with underwater microphones, and even deployed 46 of their own experimental fishing nets on 14 fishing boats in order to actually quantify the extent of the dolphin fish-stealing problem. Of the 140 captains, 131 reported observing dolphins in the past year. The instruments also picked up dolphin sounds year-round. The net damage wasn’t huge—around 1.4 square meters lost per 80 meters of net—but this increased by a factor of six in areas with more dolphins. There wasn’t enough data to make a statistically significant claim—but there was enough data to blame dolphins for some of the damage. The dolphin-fishery war has created a cycle. We fish, there’s less fish, the dolphin go looking for fish, they steal ours, so we go fishing more. What do we do? The researchers suggest better fishery management and more regulations. Loud underwater noisemakers might act as defense, but their impacts on dolphins and other species haven’t been studied. Plus, that seems really mean. Or we just surrender. Perhaps dolphins would be a better dominant species to rule the Earth than humans have been.